ONE OF THE COUNTRIES THAT IS COMPOSED OF CREATIVITY CROSS-SECTIONED WITH CULTURE IS INDONESIA: FULL OF COLOUR, FULL OF STORIES, FULL OF SURPRISES. AMANDA INDAH LESTARI, THE CREATIVE DIRECTOR OF LEKAT, LANDMARKS EVERY COLLECTION AS AN INVENTION THAT TRIUMPHS SKILLS AND STORIES. EMBODYING THE MEANING OF LEKAT IN BAHASA INDONESIA; LASTINGLY MEMORABLE, SHE HAS BEEN CREATING, INVENTING AND INNOVATING WITH HER DISTINCTIVE STYLE WHICH DRAWS UPON THE VARIOUS ASPECTS OF INDONESIA’S RICH AND DIVERSE CULTURE. THE COLLECTIONS OF LEKAT, NARRATES THE FORTITUDE OF BADUY TRADITIONAL WEAVERS TO SHARE THE BEAUTY OF INDONESIAN CULTURE THAT IS MANIFESTED IN EVERY UNIQUE FABRIC MOTIF - THAT HAS NEVER FAILED TO TELL STORIES OF DREAM, DETERMINATION AND TRIUMPH. CELEBRATING CLASSINESS WITH AN EDGE, EVERY COLLECTION OF LEKAT FOR EVERY SEASON IS ANOTHER FLAIR FOR FASHION PRESENTATION THAT INTEGRATES TRADITIONAL TEXTILES INTO MODERN DESIGNS THAT LETS MEN AND WOMEN BE COMFORTABLE WHILE MAKING A STATEMENT OF ELEGANCE. LEKAT IS LASTING, CHIC AND ICONIC. FOR FASHION SCOUT AW17 LEKAT ARE COLLABORATING WITH LAST SEASONS ONE TO WATCH WINNER BILLIE JACOBINA. THE COLLECTION CELEBRATES THE BEAUTY OF DIFFERENCES AND TOLERANCE. 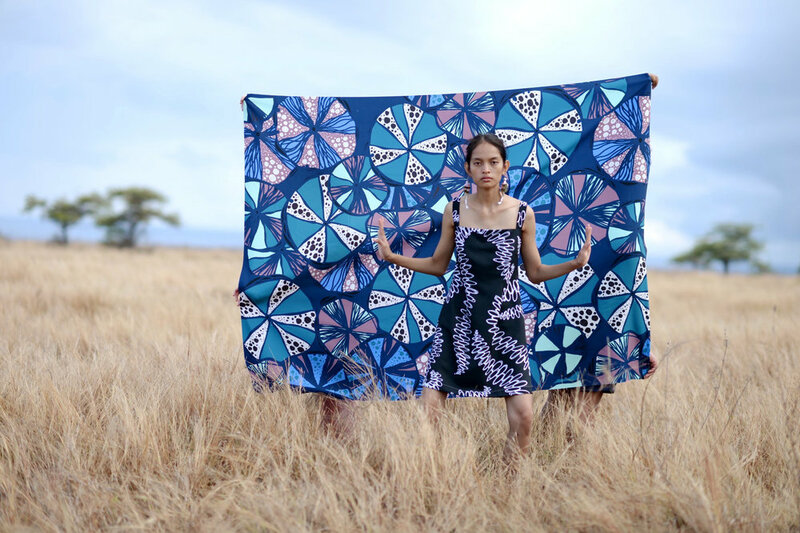 INSPIRED BY THE FAMOUS INDONESIAN FOLKLORE; PUTRI MANDALIKA AND NYI RORO KIDUL, THE COLLABORATIVE COLLECTION IS BEAUTIFULLY TRANSLATED INTO EDGY DESIGNS AND PATTERNS. IN THIS WORLD, THERE ARE TOO MANY DIFFERENCES AND PERCEPTIONS. LEKAT BELIEVES THERE IS ONE THING THAT CAN UNITE US ALL; A DESIGN AND PATTERN ASSEMBLE IN A BEAUTIFUL FASHION PRESENTATION.